OTTAWA — The federal government has no plans to launch retaliatory economic measures against Saudi Arabia, Finance Minister Bill Morneau said Thursday in the wake of a series of actions taken by the Middle Eastern kingdom as it seeks to punish Canada in a still-unfolding diplomatic feud. Angered by the condemnation, Saudi Arabia has also tried to sting Canada's economy by halting future trade and investment deals and by cancelling lucrative scholarships that would have seen 15,000 of its citizens study in Canada. One media report said Saudi banks and pension funds were ordered to sell off their Canadian assets, although that report remains unconfirmed. "We're paying close attention to this situation, of course, because we wanted to understand the impacts," he said in Ottawa after being asked if the government intended to hit back at Saudi Arabia with economic reprisals of its own. "We're not considering any responses." Morneau later said he "can't yet fully quantify" the impacts in Canada of the Saudi actions, since Ottawa is still trying to collect information on their full scope. He called the challenges created by the dispute "unprecedented" and "a bit surprising," but he stressed that Canada's in a very good economic situation. On the possible sale of assets by major Saudi investors, Morneau said he couldn't confirm that any such thing is underway. "We have not seen significant changes in our markets, so whatever may or may not be happening is clearly not a big impact on our markets," Morneau said. "It's a situation that we have to watch — but there isn't a big economic challenge." The Saudi Press Agency said Thursday that the "diplomatic crisis" wouldn't affect the kingdom's petroleum supplies to Canada. But uncertainty over the state of affairs between the two countries continued to hang over Ottawa. "We're working to fully understand the measures they might take," said the official, who spoke on condition of anonymity given the sensitivity of the matter. "It's still a little bit unclear." Saudi foreign minister Adel al-Jubeir told reporters in Riyadh this week that Canada has been given the information it needs to correct the tweets and that it's up to Canada to step up and fix its "big mistake." Prime Minister Justin Trudeau has indicated he will not withdraw Canada's criticism of the kingdom over the arrest of several social activists last week, nor will he apologize for expressing human rights concerns. "Canada will always speak strongly and clearly in private and in public on questions of human rights," Trudeau said during an event Wednesday in Montreal. 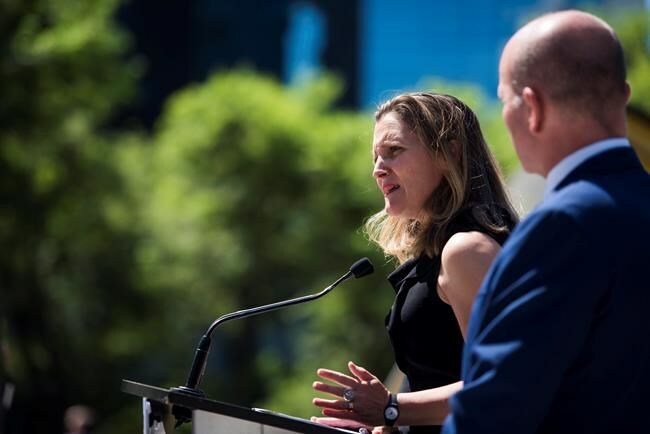 Freeland took some criticism for using Twitter to push Canada's foreign policy positions, but Trudeau defended the tactic, saying Canada would continue to use all the communications tools available to make its case. With the potential economic fallout from the Saudi actions still coming into focus, Riyadh's decision to cancel thousands of scholarships is expected to hurt — at least a little. Analysts believe Saudi Arabia holds somewhere between $10 billion and $25 billion in Canadian currency. Michael Currie, an adviser at TD Wealth, said there were some early jitters amid a report of a possible selloff of Canadian assets, but that the markets didn't take long to overcome it.